ITR – Income Tax Returns e-filing – Which ITR Should I File? The following infographic will help you find out which type of income tax return is applicable to you for FY 2017-18. Once you figure out which ITR you need, click on the links below to learn more about them. Who cannot use ITR 1 Form? If your total income exceeds Rs 50 lakhs. Want to know more about the ITR-1 Form? Why not read our comprehensive guide to the ITR-1 Form? Get answers to all your questions about how to fill the ITR-1 Form. Income from Other Sources (including Winnings from Lottery and Income from Race Horses). Further, in a case where the income of another person like one’s spouse, child, etc. is to be clubbed with the income of the assessee, this Return Form can be used where such income falls in any of the above categories. This Return Form should not be used by an individual whose total income for the AY 2018-19 includes Income from Business or Profession . For declaring these types of Income, you may have to use ITR-3 or ITR-4 . Want to know more about the ITR-2 Form? Why not read our comprehensive guide to the ITR-2 Form? Get answers to all your questions about how to fill the ITR-2 Form. 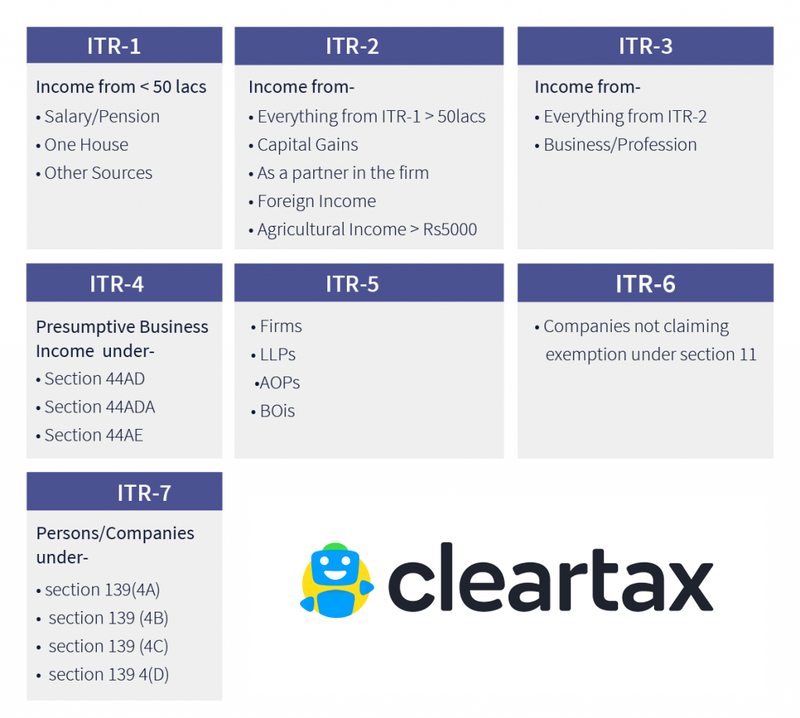 ClearTax automatically selects the ITR you need to e-File. If you’re filing with ClearTax, you may not even have to read this guide. The current ITR 4 is applicable to individuals and HUFs having income from a business or profession and who have opted for the presumptive income scheme as per Section 44AD ,Sec 44ADA and Section 44AE of the Income Tax Act. However, if the turnover of the business exceeds Rs 2 crores, the taxpayer will have to file ITR-3. This return has to be filed electronically only. For persons including companies required to furnish return under section 139(4A) or section 139(4B) or section 139(4C) or section 139(4D). Return under section 139(4A) is required to be filed by every person in receipt of income derived from property held under trust or other legal obligation wholly for charitable or religious purposes or in part only for such purposes. Return under section 139(4B) is required to be filed by a political party if the total income without giving effect to the provisions of section 139A exceeds the maximum amount which is not chargeable to income-tax. fund or institution or university or other educational institution or any hospital or other medical institution. Return under section 139(4D) is required to be filed by every university, college or other institution, which is not required to furnish return of income or loss under any other provision of this section. Want to know more about the ITR-7 Form? Why not read our comprehensive guide to the ITR-7 Form? Get answers to all your questions about how to fill the ITR-7 Form. How to E-File ITR 1? How to E-File ITR 1 with Rental Income? How to E-File ITR 2 when you have sold house property or land or building? How to View Form 26AS and Download through TRACES Website?